DoubleDown Tandino and Morris Vig have both touched on a recent ‘dilemma’ concerning events in Second Life, attendance to events seem to be shrinking during an increase and vibrancy within Second Life. Morris points out highlights of a successful events but that doesn’t explain the full reasoning for a lack of event attendance. Event attendance is declining because they many events have become bland, dull and repetitive. 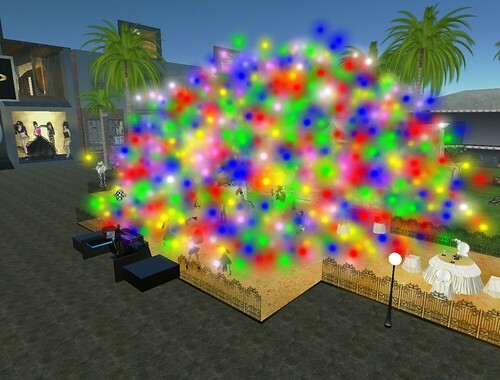 Many performers do not follow successful strategies for Second Life, which reflects upon their event. The Intel Sunflowers event demonstrated many key elements for successful event; it engaged participants to plant virtual sunflowers as a part of a contest, collaborated with popular Second Life acts by hiring them, had definitive goals and achievements, and used all of these components to provide effective communication and promotion. On a larger scale, The American Cancer Society’s Second Life Relay for Life another great example of these key strategies implemented to promote creative and successful events! Crowd recessions occur for the same reason 90% of virtual world projects fail within 18 months; events become bland, repetitive and non-engaging. Many of the events I’ve attended lately are dull, either a musician performed the same series of songs heard before or a DJ is only mixing or playing music; there’s little to no interaction with the crowd. While there’s a lot of flashing lights, loud music and a great personality, these individuals are not reaching out to me and the event remains the same. Some tips to bring the crowd back is through conversation, interjecting yourself into the current discussions, ask questions, or provide interesting stories. Offer a prize or reward for event attendance, partner with a band or venue to “sponsor” your gig by providing prizes or an extra promotional avenue. Give the attendee a reason for coming to event, not just because your going to be there. This entry was posted in DJ Tips and tagged DJ Tips, event mangement, musicians, Second Life, Successful Strategies, Tips. Bookmark the permalink. I like this idea. I went by your website surprisingly and simply been your fan. Continue posting as I am going to come to peruse it regular!! It's a fantastic propose for sure! Expectation this voyage devise be further triumphant. Bless Lauren for offering a few hints of the marvelous gathering.